(London’s Daily Telegraph) – A Nebraska resident worried about his grandmother after Hurricane Matthew hit found a genius way to check she was OK – by sending her some pizza. Eric Olsen hadn’t heard from his grandmother, Claire Olsen, for 48 hours after her phone line was disconnected in the tropical storm. 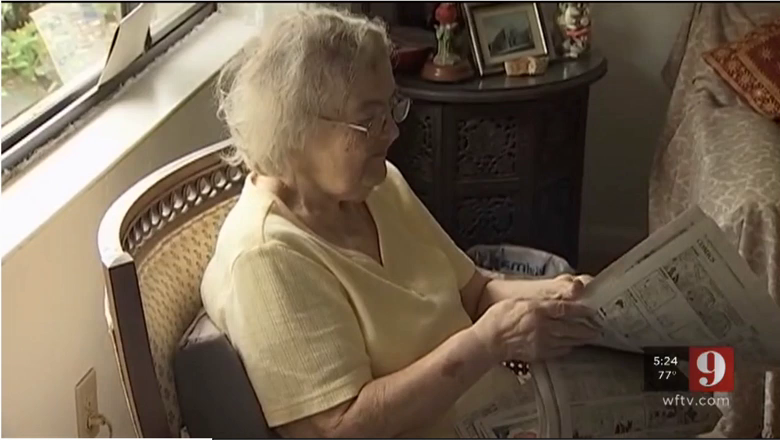 With the 87-year-old living thousands of miles away on her own in Palm Coast, Florida, her quick-thinking grandson decided to send her a pepperoni pizza. “We haven’t been able to get hold of my grandma for two days since Hurricane Matthew,” he posted on Facebook. 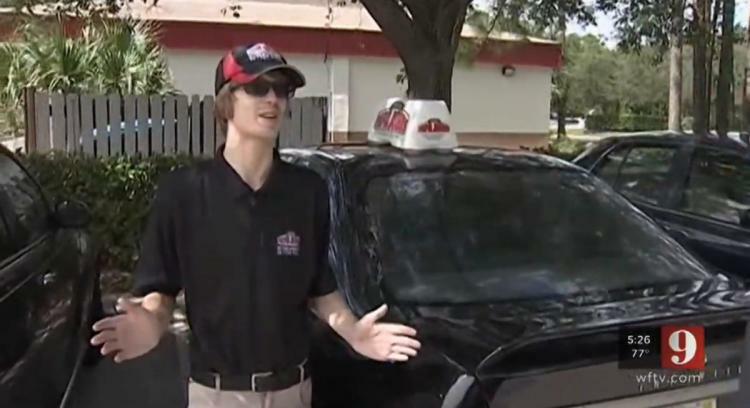 “The police and sheriff departments were overwhelmed so I called the only other people I could think of… Papa John’s Pizza. 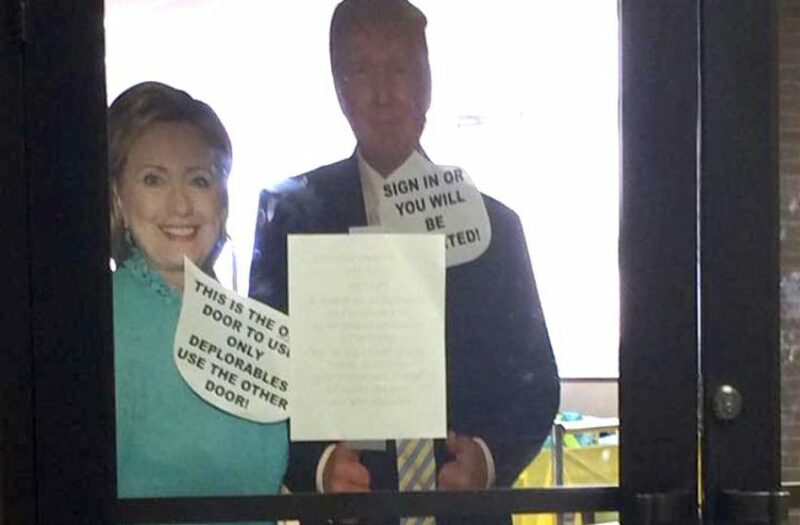 (Associated Press) – LONGVIEW, TEXAS – An East Texas school librarian has been suspended after posting life-size cutouts of Donald Trump and Hillary Clinton and adding modified campaign comments that some students and their families found offensive. Trustees of the Longview Independent School District on Monday night suspended the Longview High School librarian for two days without pay. The Longview News-Journal reports the employee recently displayed the cutouts of the presidential candidates at the library entrance. The district issued an apology last Thursday. Longview is 120 miles east of Dallas. (London’s Daily Telegraph) – California police responded at once when they received a call from a distressed 18-year-old who heard strange noises coming from within the home. Before he heard the strange noises, his dogs were barking in distress. The young man, who was home alone, called 911 after barricading himself and his dogs in a room, to protect themselves from the intruder. 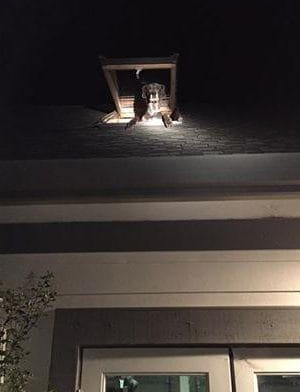 Sonoma Country Sheriff Office spokesperson Spencer Crum told The Dodo: “”We came out and he’s afraid, thinking there’s a prowler in his house. That is when they saw the Great Dane popping his head out of the skylight. It turned out that in all the panic, the young man had failed to account for all the family dogs. The Great Dane was in fact one of their dogs and had been prowling around an upstairs bedroom. “One of the deputies outside the house heard this scratching noise,” said Mr Crum. 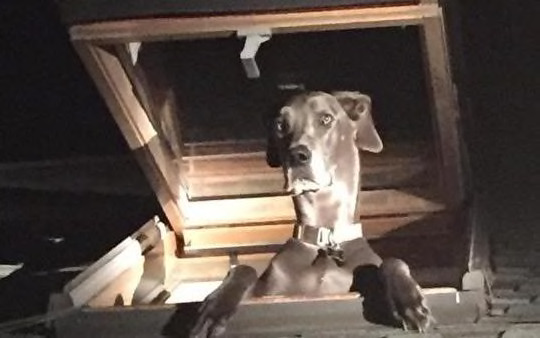 The dog in question was tall enough to stand on his hind legs and stick his head out of the open skylight, in order to reach the cool night air. The smaller dogs were barking in distress because they wanted to be able to get up there, as well. The police force was bemused by the unusual call. Mr Crum said: “I’ve done this job for 25 years, and there’s been a lot of strange calls.